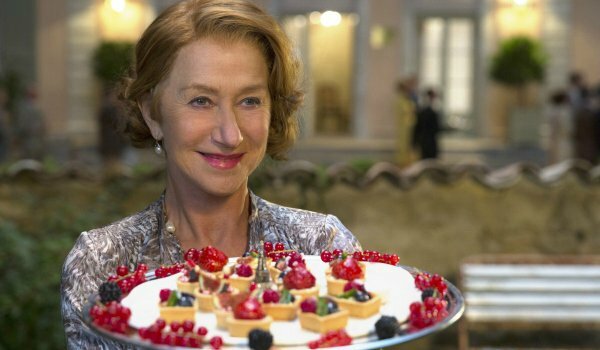 We have said this before about certain movies opening in theaters (hello, Chef), but do NOT go to Lasse Hallstrom’s The Hundred-Foot Journey hungry. The title refers to the distance separating rival restaurants on the outskirts of Paris – and the personal and professional journey taken by a young chef (Manish Dayal) as he starts in his father’s Indian restaurant but eventually aspires to cook in a venue blessed with Michelin stars. Lasse Hallstrom jumped on the phone recently to talk about his film. But to talk about his film means talking about food, and the act (and art) of eating delicious food in exquisite restaurants. The joy of The Hundred-Foot Journey lies in experiencing food, in creating (and eventually eating) delicious dishes. Make reservations at your favorite eatery for right after your screening. Trust me. Here’s what Lasse Hallstrom had to tell us about The Hundred-Foot Journey… and about eating! A lot of food was wasted filming Journey, and Hallstrom feels horrible about it. Food-prep scenes require a lot of food items. And they require food in various stages of preparation – from sliced to diced, sautéed to served. Lasse Hallstrom knows he went through a LOT of food… and he doesn’t know where it went. "I was horrified. One day, it was on the schedule that we were going to shoot a scene in a two-star restaurant with the French food. And they had spent all day making beautiful plates. Like 50 of them. And then we never had time to get to them! I don’t know what happened to those plates of food. That kept happening. You never know how far you really are going to get into a scene. So a lot of food was probably wasted. It’s terrible." Lasse Hallstrom is a vegan. Except when he cheats. "Because sometimes I need to have Japanese food," he said with a laugh. But most of the times he tries to stay to a strict vegan diet, and he loves to eat at Nobu. "Any Nobu," he says. "Like the one in downtown New York, or out in Los Angeles. That is my favorite kind of food." A CNN documentary about Bill Clinton’s diet prompted Hallstrom to go vegan. "I clicked through to a few articles to find the source material for the doc," he said. "I also found the book about veganism. I read it right away, and I have been a vegan ever since. I got much more energy (after switching). My heart palpitations went away after 2 weeks. So I can’t go back to normal eating anymore." He goes to vegan restaurants for the food, not the atmosphere. "I can appreciate good atmosphere, but that’s not the reason why I go to a restaurant," Hallstrom admits. He name-drops a few vegan restaurants – Pure Food & Wine, Candle 79 on the Upper East Side – that he likes to frequent when in Manhattan. But each time, he says that it rarely has anything to do with the room in which the food is being served. (Sorry, restaurant managers.) It has everything to do with the food on the plate. Michelin meals mean something special. Lasse Hallstrom has eaten in Michelin-rated restaurants before, and he thinks we should believe the hype. If you haven’t been lucky enough to eat in a restaurant that has received at least one Michelin star, Hallstrom says you need to rectify that as soon as humanly possible. He says that the industry really doesn’t hold it in as high of a standard as they once did – and as high as is portrayed in The Hundred-Foot Journey, where earning a star means everything – but the quality in the 3-star Michelin restaurants, particularly the ones in Paris, means the experience can be life altering. Hallstrom, for example, proposed to his wife in a 3-star Michelin restaurant. "I even remember what we had there that night," he reminisces. "I had a cabbage dish, with supplements. It was a long time ago."